What happened to the Met? Last August, Paul Stephenson, Deputy Commissioner of the Metropolitan Police, said: ‘ This was intended to be mass murder on an unimaginable scale ’ while John Reid, the Home Secretary, exclaimed that ‘ loss of life would have been on an unprecedented scale ’. So on one hand Sir Ian Blair says he doesn't have any specific intelligence, and on the other that the threat is greater than during WW2 when tens of thousands of people were killed in London. This is irresponsible propaganda. During the same interview, Sir Ian Blair said: ‘I'd say this: I, for my own part, I am quite confident that I will not face any kind of misconduct... in relation to Stockwell. [...] I'll just say that I'm confident, shall we leave it at that?’ This follows the news the previous week that the High Court of England and Wales dismissed the legal challenge brought by the family of Jean Charles de Menezes against the prosecuting authorities' decision not to bring criminal charges against any individuals in connection with his killing in London in July 2005. Consequences of shooting Jean Charles de Menezes: a dirty campaign (he was wrongly accused of wearing a too warm jacket, of being illegally in the UK, even of having raped a woman - all this eventually disproved by the family), no individual officer involved to be charged (and one of the officers killed another man since), a promotion for the officer in charge, and possibly a Health and Safety charge for the Police (of which the fine would then have to be paid by taxpayers). In times of perceived unparalleled threat, one is concerned as well by the uncontrollable actions of a Police so confident in its power over the law. The next and last step is for the Met Department of Professional Standards' misconduct office to decide what action to take. Details in the usual place. Trying to find out a bit more about this misconduct office, I discovered a 156-page 'Misconduct Investigation Guide' that was published under the Freedom of Information Act, which coincidentally happens to be under some threat. The National DNA Database (NDNAD) records the DNA profile for a particular individual. It does not hold data on arrest and criminal records. This information is held on the police national computer (PNC). The facilities do not exist to cross-refer between all records on the NDNAD and PNC to the level of detail that would be required to provide the information sought. However, we can say that information provided by the Police Information Technology Organisation (PITO) from the PNC indicated that as at 14 July 2006, when there were approximately 3,457,000 individuals on the database, 2,922,624 of these persons also had an entry on PNC. Of these, 2,317,555 (79.3 per cent.) had a conviction or caution (i.e. a criminal record). The difference between the two figures is attributable to: young persons under 18 who have a formal warning or reprimand recorded on PNC; persons who have been charged with a recordable offence where proceedings are on-going; and persons who have been arrested for a recordable offence but no further action was taken. In other words, 1,139,445 of the entries in the DNAD as of last July were for persons never having been found guilty of any crime. A third (32.96%) of the DNAD entries are for innocents. As indicated in the answer of 20 December 2005, Official Report, column 2890W, there were 139,463 people who have a DNA profile on the National DNA Database (NDNAD) who have not been charged or cautioned with an offence. This figure comprised 124,347 people who have been arrested and subsequently not been charged or cautioned with an offence and 15,116 people who had volunteered a sample and given consent to the profile being loaded on the NDNAD. It is not currently possible to determine how many of the 124,347 "CJ arrestees" (persons with a DNA profile on the National DNA Database who have been arrested and subsequently not charged or cautioned with an offence) have never been convicted of an offence. [...] The figures might suggest that the remaining 100,828 persons have never been charged, reported for summons or sanctioned for any offence. The number of innocents in the NDNAD in a year has gone from 139,463 (Andy Burnham) to 100,828 (John Reid), to eventually more than an eightfold to 1,139,445 (Joan Ryan). Is it alright for the Parliament and us to be misled with such contradictory figures? More on the NDNAD in Is the UK a police state? Andy Hayman, the Metropolitan Police's assistant commissioner responsible for anti-terror probes, said few arrests or charges arose from such searches. I am not sure what purpose it serves, especially as it upsets so many people, with some sections of our community feeling unfairly targeted. I raised this very issue with MPA last year. The IPCC has confirmed the findings of the Police. I should now expect a copy of the report from the Police. LANTERN, a mobile fingerprint system under development by PITO. C-NOMIS (Custody- National Offender Management Information System). Fingerprint based for confirmation of prisoner identity against IDENT1 and PNC. Pilot of a Methadone dispensing system using iris recognition, at HMP Eastwood Park. Trial of fingerprint based access control to IT systems in prisons. As for planned projects there are a number of smaller projects some of which are partnerships with other organisations in the UK and abroad. The Home Office is continuing to examine new technologies, and new ways of using existing biometric technologies, to ensure the protection of the public. The Parliamentary Under-Secretary, Home Office did say "include" - one major omission is the NDNAD (National DNA Database). And the PNC includes data from some of these biometric databases. Useful search string to keep up to date with the Governement's position on biometric: They work for you. FIND Pilot has now gone Live. Good news on the FIND project is that the FIND Pilot has now gone live in 5 Forces around the country. The Pilot started 06/11 and will run for approximatly three months with an option to extend the system if requested by the Forces and it is feasible. A Benefits / evaluation workshop is happening 29/11 to assess the first months success of the Pilot and capture the benefits gained so far to the Forces. The Forces involved in the Pilot are Lancashire, West Yorkshire and Merseyside (supplying their data and images) and Devon and Cornwal and British Transport Police Leeds Office (read only). We have had requests for access by other Forces '/ goverment bodies and of which need to be considered. Some of my personal encounters with IDENT1 and NDNAD: fingerprints, palm prints and DNA samples taken. As recorded in the PNC. Raising some of these issues with the MPA. Finding that private companies are keeping their own DNA databases, possibly including my own DNA; complaining about it to the ICO; one response; a further one. Discovering that DNA samples and profiles are kept until death of the subject. Discovering that DNA samples and profiles are kept for eternity and that the NDNAD records information as to whether the subject has been convicted (which can of course be incorrect). The Home Office is also involved in these changes. Human Rights Watch (HRW) has a news about report by the European Parliament's Temporary Committee on illegal CIA activity in Europe. Poland, the United Kingdom and Italy are singled out as having been especially uncooperative. The committee's report concludes that there were at least 1,245 overflights or stopovers by CIA planes in Europe, and that some of these flights probably involved prisoner transfers. The End of Violence by Wim Wenders, released in 1997 depicts a city (Los Angeles) under secret surveillance from a network of cameras. When this surveillance system detects that a crime will be committed, the suspect is automatically shot. It's the end of violence as we know it. Police and councils are considering monitoring conversations in the street using high-powered microphones attached to CCTV cameras [...] The microphones can detect conversations 100 yards away and record aggressive exchanges before they become violent. Criminal profilers are drawing up a list of the 100 most dangerous murderers and rapists of the future even before they commit such crimes, The Times has learnt. The highly controversial database will be used by police and other agencies to target suspects before they can carry out a serious offence. Pilot projects to identify the highest-risk future offenders have been operating in five London boroughs for the past two months. More on what's happening in the UK. 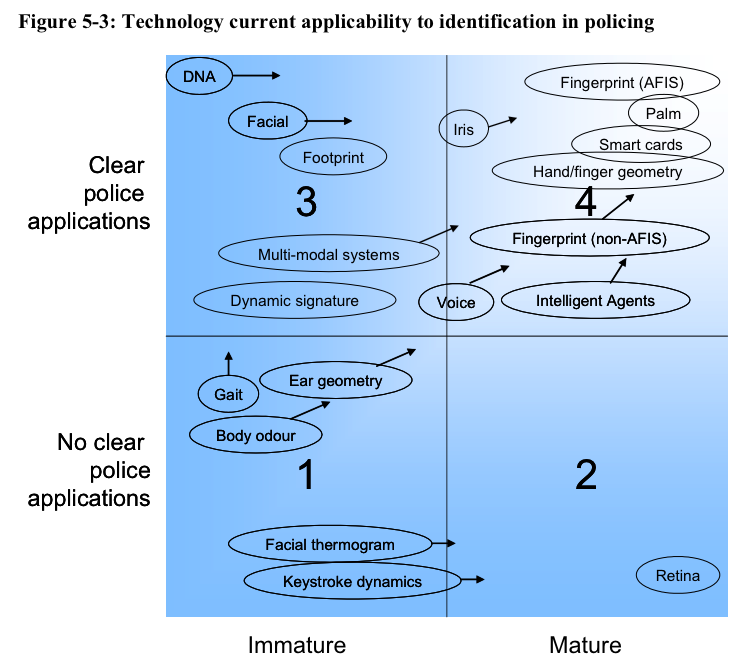 For more on terrorist profiling see my essay on techie and terrorist behavioural profiling. Unfortunately this document includes other surprises such as the mention that DNA profiles in the NDNAD are not destroyed even when an profiled individual dies. I wrote more about this and some other aspects directly affecting me in a new entry on the Innocent in London page. do not interrogate the traveller as a potential criminal or illegal immigrant. All the questions should be well balanced and asked in a friendly way. questions posed by the traveller should not be considered as intrusive and should be answered in a factual and polite manner. Some of these entries via TSA Security Round-Up and previous posts. A few of the upcoming events you may want to participate in, attend or watch. I'll be at several of them. Come and say hi if you're there as well. Since Tony Blair's New Labour government came to power in 1997, the UK civil liberties landscape has changed dramatically. 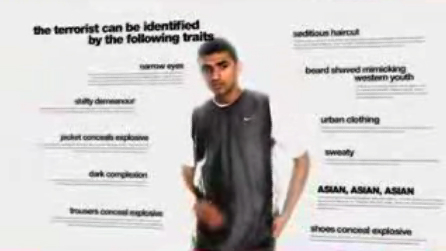 ASBOs were introduced by Section 1 of the Crime and Disorder Act 1998 and first used in 1999. The right to remain silent is no longer universal. Our right to privacy, free from interception of communications has been severely curtailed. The ability to travel without surveillance (or those details of our journeys being retained) has disappeared. Indeed, as Henry Porter (the Observer journalist famous for his recent email clash with Tony Blair over the paring down of civil liberties) reveals in this unsettling film, our movements are being watched, and recorded, more than ever before. The meeting will be attended by senior representatives from the emergency services, Transport for London, and the National Health Service. The Committee will ask them questions about what progress they have made on key issues such as underground communications, digital radios / alternatives to mobile telephones, and putting in place plans to care for survivors of major incidents. Sir Malcolm Rifkind, QC, MP, Ross Anderson and Henry Porter consider where we go from here. The Identity Cards Act 2006 is law, and must be repealed, but meanwhile the government is already working on extending its scope, through "information sharing" across the public sector and an "Identity Management Action Plan" to be produced by the end of this year. What new threats does this offer to personal liberty? How can the slide to the database state be halted? Themes: Anti-terrorism measures, detention and repression of asylum seekers and other migrants, new police powers against demonstrators, ASBOs, ID cards and state surveillance; and how foreign policy and new state strategies for social control relate to all of these measures. David Cole and Louise Christian will discuss whether sacrificing civil liberties has in fact made us safer, and suggest that some trade-offs in liberties may have actually made us less safe. They will discuss what has and has not changed since the terrorist attacks of September 11 and July 7, respectively, and how we should proceed as we seek security and justice for all in the future. Informing yourself is one aspect of how you can act to help halt and reverse the erosion of our civil liberties. 11 arrests under legislation other than the Terrorism Act, where the investigation was conducted as a Terrorist Investigation. 32 Charged under other legislation. E.g. murder (incl conspiracies), grievous bodily harm, firearms, explosives offences, fraud, false documents, etc. 8 Terrorism Act convictions to date. 143 people were arrested under the Terrorism Act 2000 and Terrorism Act 2006 - To 30/09/2006. 16 arrests under legislation other than the Terrorism Act, where the investigation was conducted as a Terrorist Investigation. 13 Charged under other legislation. E.g. murder (incl conspiracies), grievous bodily harm, firearms, explosives offences, fraud, false documents, etc. 4 Terrorism Act convictions to date. I was likely counted in some of these numbers. The investigation of the Police following my complaint is now complete. The findings have to be confirmed by the IPCC before I am provided with a copy of the report. I updated my account and the Is the UK a police state? article with much more information on how the Police and the Government manager the national DNA database (NDNAD). One in four men could soon be included on the national DNA database which is helping to turn Britain into a nation of suspects, an expert group has warned. The database has been established with little or no public consultation but over the past 10 years has collected DNA profiles on more than 3.5 million people, including 24,000 children and youths under the age of 18. Sir Bob [Hepple, chairman of the Nuffield Council on Bioethics] said that this implies that the Prime Minister would be happy to see every citizen's DNA profile being stored on the database. "The cost would be enormous but there is also the deeper question - instead of being a nation of citizens we become a nation of suspects," Sir Bob said. The figures I had included in Is the UK a police state? where from March 2004. A million more DNA samples have been collected since. The Nuffield Council on Bioethics is launching a consultation exercise to investigate on a number of questions raised by the ethical issues surrounding the forensic use of bioinformation. Tomorrow is the third reading of Legislative and Regulatory Reform Bill. The Reclaiming our rights conference will be on Saturday 2nd December. Register now! I'll be participating. The investigation is close to conclusion, but the IPCC will have to accept the final report before I can get a copy of it. I just realised that the anniversary of going public, in the Guardian, passed just a month ago. Other updates: new Independent article by Henry Porter on the limits of liberty and the Terrorism (United Nations Measures) Order 2006. Spy Blog spotted the Times article about Raouf Abdullah Mohammed. He's been acquitted by a jury with four non-guilty verdicts only to be sentenced to a control order at the request of the Home Office (who initially tried to deport him). This Government not content with passing so many Home Office bills curtailing our civil liberties, is now entirely bypassing the legal system by ignoring the verdict returned by a jury. Who would have thought this possible in England? Update:In a comment on Spy Blog, sam_m mentions that this is not the first time the UK Government sentences persons acquitted by the legal system. For instance: In 1993, John Matthews was arrested and detained for 10 weeks by the Police in connection with an IRA bombing. When the case came before a Magistrate's Court the prosecution offered no evidence and he was told by the Magistrate that he left the Court without a stain on his character. As he literally left the Court, on the steps, he was served with an "Exclusion Order" and immediately removed to N.Ireland. 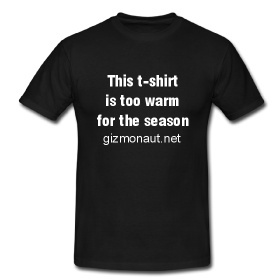 I've been fixing links that went dead on gizmonaut.net. I had several links to the Information Commissioner's Office and most of them went dead, including the direct links to entries in the Register of data controllers. I searched for the entries and instead of giving direct links I included the registration number (which should last for longer). One entry I cannot find is the one for the Metropolitan Police. It seems to have disappeared from the register. At least I can't find it using all the names (including Metropolis and MPS) or addresses I can think of. If you do find its entry please let me know. At least the MPS has some information on Data Protection on its website. That is no more the case for the MPS Directorate of Professional Standards. There doesn't seem to be any information at all anymore on it available on the Metropolitan Police's website. The page linked from all over the web doesn't exist anymore. Some review information of Professional Standards is available on the MPA's website and some of the DPS staff are currently investigating my arrest) so this Directorate still seems to exist. ‘[...] he felt compelled to speak out to protect other innocent travellers from a similar experience. Added a pointer to Glenda Jackson analysis of the latest profiling: Travelling while Asian. Sorry for all the old posts that are likely to have appeared in your aggregators. I realised having links in titles was a bad idea. John Reid, the Home Secretary, said that ‘loss of life would have been on an unprecedented scale’. What are they trying to achieve with this unprecedented scale terminology? Isn't one supposed to be a professional presenting dispassionate facts and risk assessment, and the other a politician offering a measured reaction with a way forward? Instead all we get is propaganda. Go read or re-read Orwell's short essay Politics and the English Language. This should be compulsory reading for anyone writing in English. You may also be interested in an analysis of why the Metropolitan Police arresting innocents may be motivated by a propaganda strategy. If so, read A pawn in their propaganda machine. I got too many emails from persons stopped and searched, and some even arrested just for taking pics of buildings. This is apparently considered 'hostile reconnaissance'. This is utterly ridiculous and reminds me of the recent time when the BT Tower (visible from a large part of London) was not on any AtoZ map so it couldn't be found by (then IRA) terrorists. A friend sent me a link to BBC story published today about an Iraqi man charged with filming Big Ben, the Houses of Parliament and the London Eye. I've practically stopped taking pics of buildings (in London) and have updated the web page listing some new interesting aspects of English law and Police behaviour with an entry on hostile reconnaissance. This is one of the very few changes of behaviour, with avoiding the tube even more than I used to, that I've adopted. More needs to be done to expose this further infringements of our civil liberties, however this is not a fight I have the time or energy to take on at the moment (remember that my idle doodles were once considered by the Police to be a plan of Southwark station). The Information Commissioner's Office explains that LGC may be a data processor processing personal data under instructions from the MPS acting as the data controller. I fill in (yet another) a complaint form. I've added a link to a PDF of the draft statement. If you've got the time to have a look at it and have any suggestion for improvement, please send me an email. My complaint has now been recorded. The IPCC can't offer any guidance, but a solicitor suggests I can write the statement on my own and offers some helpful advice. I decide that a full investigation is the most appropriate option and start working on a draft statement. Meeting John Roberts, Chair of the Stop & Search Scrutiny Board at the Metropolitan Police Association (MPA). Phone call from the Investigative Officer tasked with my complaint against the Police. I need to decide what process the complaint should follow and start working on a statement. If you have any experience in these matters and are willing to offer some advice, please read on and contact me. My complaint against the Police is considered serious enough for the IPCC to supervise the investigation that will be conducted by the Professional Standards Department of the Metropolitan police. Lord Carlile publishes his Report on the operation in 2005 of the Terrorism Act 2000. Added info from a practice advice issued by the ACPO. I found this document while looking for any Police guideline on "hostile reconnaissance" and taking pictures. I hear more and more anecdotes of Police intimidation (Stop and Search, and sometimes arrest) of Londoners just taking pictures. I didn't get it (unless it was sent to a list). So if you did send me an email this week, please resend it. The matter of the complaint I filed with the IPCC has been referred to the Professional Standards Department of the Metropolitan police for consideration. I am told by the Library that this is the 52nd Home Office Bill since the Government came to power in 1997. Some notes from the Metropolitan Police Authority (MPA) meeting. Apparently Sir Ian Blair, the Met Commissioner, will be at the full Authority meeting as well. Will he use this opportunity to apologise? This would be a welcome surprise. As ‘ The Metropolitan Police Authority (MPA) does not consider the Metropolitan Police Service (MPS) to have overreacted to the horrific terrorist attacks ’ of last July 2005, and that ‘ the MPS response in terms of both disaster-management and investigation has drawn respect and recognition from around the world ’ we have an essential disagreement. If the MPA finds the MPS is doing a perfect job in respect to its anti-terrorism response then a discussion on how it can be improved is not possible. This satisfaction can not be shared by all Londoners when there are so many stop and searches under Section 44(2) of the Terrorism Act 2000, and subsequent arrests of innocent Londoners. This does not make us any more secure but does impact the lives of Londoners. Even Sir Ian Blair, the Metropolitan Police Commissioner, appears to disagree with MPA's assessment. He is reported by Bloomberg to have said at the MPA's own 'Together Against Terror?' conference last December: ‘ London police have arrested 130 suspects since suicide bomb attacks in July, yet the threat of terrorism continues to increase ’. That's more than all the arrests, whether in connection with terrorism or not, resulting from stop and searches conducted under Section 44(2) during the combined financial years 2003/4 and 2004/5 (the Met arrested 125 persons during this period according to the Statistics on Race and the Criminal Justice System). And that's only for five months. This shows that that the MPS must work more effectively with more intelligence instead of stopping, searching and arresting Londoners, without reasonable cause, on the basis of a stereotypical profiling. How can the MPA be satisfied that the MPS keeping DNA samples, fingerprints and palm prints of innocents forever, and PNC records, including mentions of non-conviction, until the Londoner reaches 100 years old increases our security. The MPA is to be commended on getting the MPS to publish statistics such as the Statistics on Race and the Criminal Justice System. May I suggest the MPA puts further pressure on the MPS for the statistics to be published earlier and to include the number of arrestees being tried and how many are convicted. The MPA's 'Together Against Terror?' conference was I'm sure a very interesting. It is unfortunate that its existence was announced by a press release only three days earlier and that the selection of the over 150 (100 in the press release) community members has not been open and transparent. I couldn't find transcripts or videos of the event, either. Hopefully lessons have been learned from organising this event and the forthcoming events will be more open to Londoners. I'll have three minutes to cover all these points. I'll update the story after the event. How several helpful individuals have been of great assistance. And using my right as a member of the public to put a written question to the Metropolitan Police Authority (MPA). A place to live: Are you suspicious about any tenants or guests? Money: Individuals may set up bogus bank accounts, copy credit cards, return goods for large cash refunds. Equipment: If you are a retailer, do you have any cause to be suspicious about anything being bought? Common sense would have prevented such publication. Don't law abiding residents also need "a place to live"? Don't law abiding residents need to be aware of security measures to respect them? Don't law abiding residents ever return goods even for large cash refunds? Don't law abiding retailers sell legal goods and shouldn't be surprised to have people buy them? Surely, by this description we - local residents and retailers - are all terrorist suspects and should be arrested? I sent an email to the Council's Chief Executive about how such advice reinforces a climate of fear that will lead to further wrongful arrests of local residents. I eventually had some leaving drinks last Thursday, a week after I left Symbian to join the developer community team at UIQ Technology. A brilliant techie? Yes, very. But we hope he'll remain very merry. The experimental prototype of the programme catalogue lists my participation in the Politics Show. Added a link to the Statewatch page listing the full-text of Acts of Parliament. I filed a complaint with the IPCC. Added a few sign pictures including an amusing "lost elephant" sign seen in a pub window on Essex road. I received the MPS report into my arrest as part of a Subject Access under the Data Protection Act. I also realise that the information on the Police National Computer will remain until I am 100-year old.